Starting life as a small family company, bearmach has grown to become one of the UK’s largest independent suppliers of Land rover parts and accessories. Bearmach is now an authorised European distributor for Land Rover and Jaguar, supplying to well over 120 countries worldwide. With goods constantly being shipped in and out of its two operational sites, covering more than 50,000 square feet in Caerphilly, Wales, the company was keen to streamline its materials handling movements and enhance safety. To help achieve this, Bearmach sought Doosan’s ‘simple powerful performance’ and turned to authorised dealer Gwent Mechanical Handling. The result was a fleet of five new Doosan trucks – four compact three-wheeled electric counterbalance trucks (B15T & B20T), alongside a LEDH 18 powered pallet truck. The trucks were supplied with customised extending forks, increasing the safety and stability with which Bearmach is able to move around the parts and accessories – including high-end products like body shells, panels, and even complete Land Rover and Range Rover chassis – that are the backbone of the business. The operator compartments on the Doosan forklift s have been designed with driver comfort in mind. Optimised pedal positions, ergonomic hydraulic levers and a fully-adjustable steering wheel all help to reduce operator fatigue and maximise productivity. systems fitted as standard provides additional peace of mind. Since taking delivery of the new Doosan trucks, Bearmach has noticed a clear increase in productivity and with greater order efficiency there have been cost savings too. A focus on reliability, safety and operator comfort has allowed Doosan to become a leading provider of forklifts in the UK. With high-specification features and proven technology, Doosan also boasts the lowest total costs of ownership. 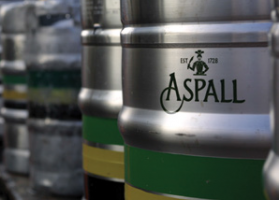 Premium cyder specialist Aspall is amongst the top ten oldest family businesses in the UK. for the past eight years, Doosan’s Pro-5 forklifts have helped to bring a little extra fizz to the 285 year old Suffolk site. Founded in 1728 by Clement Chevallier, Aspall Suffolk Cyder is owned and managed by the eighth generation of the Chevallier family. Taking its inspiration from the apple tree for three centuries, the company produces a range of award-winning cyders, vinegars and apple juice; and is now the UK’s oldest independently-owned cyder producer and last remaining English family owned vinegar brewer. 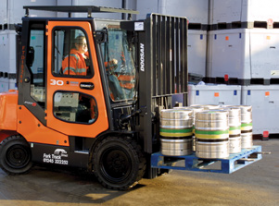 A Doosan forklift user for over eight years, it lays claim to an impressive heritage in cyder making and place a great deal of emphasis on establishing long-term relationships with suppliers. France, Ireland, Russia, Japan, Brazil, Australia and New Zealand amongst them. developments, like the recent addition of new fermentation tanks, has to be mindful of the adjacent family home. The elegant, moated, Aspall Hall has been owned by the Chevaliers since 1702. Beside the pressing room there’s also the water treatment plants, bottling and storage areas to navigate. The tight spaces need careful negotiation. With lots of forklift users on site, 35 operators are trained to operate the forklift fleet, the simplicity of Doosan’s truck made it more popular than other complicated machines that took part in demonstrations. A Doosan forklift on site at Aspall Cyder. Some new modifications have been included on this latest delivery of two and three tonnes capacity machines. Most kegs have been moved off site, but a small run of kegs continue for export and a wayward keg can prove dangerous. To keep them in their place the load back rests were modified, whilst an additional roof guard adds an extra level of protection to the operators. Building rugged, reliable, yet simple trucks has allowed Doosan to become a leading forklift provider. The range of electric, LPG and diesel Pro-5 models is Doosan’s most successful ever, with a host of features including trademark oil cooled disk brakes, integral sideshift as standard, plus award winning safety features and class-leading ergonomics. It all means companies like Aspall can rely on the best possible equipment for their expanding businesses. And with recipes handed down through generations, methods developed through centuries of careful development and the latest equipment at their finger tips, the future sweet success of Aspall is no doubt guaranteed.